Hermann Max Pechstein was born in Eckerback, Germany, and studied at the School of Applied Arts and the Royal Academy of Fine Arts in Dresden. In 1905, he was awarded the Saxon State Prize for painting. The following year, he met Erich Heckel and joined the Die Brücke group in Dresden. 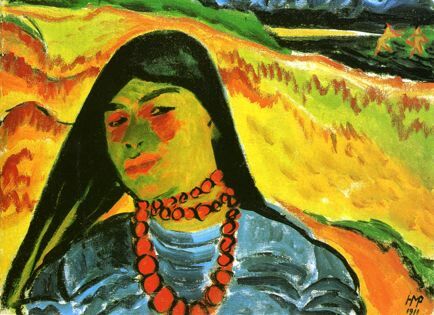 Pechstein traveled to Paris in 1908, where he met the Fauve artists and exhibited with the Société Anonyme. In 1909, Pechstein joined the Berlin Sezession and exhibited with them that same year. However, after they rejected his works (and those of other avant-garde artists) in 1910, he resigned. He then helped found the Neue Sezession with Georg Tappert and became its first president. Pechstein exhibited with the Neue Sezession, the Blaue Reiter and published in Der Sturm between 1910 and 1912. Pechstein traveled to the German occupied Palau Islands in the South Pacific in 1914, but was forced to leave when the Japanese invaded. On his return journey, he was imprisoned by the Japanese at Nagasaki. After his release in 1915, Pechstein traveled through Asia and to the USA. Upon his return to Germany that same year, he was drafted and sent to the Western Front. He resumed his life in Berlin following his discharge in 1917. After the war, Pechstein became one of the most active of the politicized Expressionist artists. During the early days of the Weimar Republic, he founded the Novembergruppe (along with Tappert, Klein and others), became a member of the Arbeitsrat für Kunst, and produced posters and illustrations for the Werbedienst (Publicity Office) of the provisional government. He exhibited in the first Novembergruppe exhibition in 1919 and contributed an essay, Was Wir Wollen (What We Want), to the manifesto An Alle Künstler. Pechstein joined the Liga für Menschenrechte und Sozialism (League for Human Rights and Socialism), supported the International Arbeiterhilfe and the Gesellschaft der Freunde des neuen Russia (Association of Friends of the New Russia), wrote for the socialist press, and contributed illustrations to many radical journals. During the 1920’s, he exhibited widely, and in 1932 he received the State Prize of the German Government. Pechstein was forbidden by the National Socialists to exhibit in Germany after 1933, and he was dismissed from his teaching position. In 1937, his works were confiscated by the Nazis, labeled “degenerate,” and six of his paintings were included in the “Degenerate Art” exhibition. During the final years of the Second World War, Pechstein was drafted into a labor detail and held in captivity in Russia. Upon his release in 1945, he returned to Berlin, where he received a teaching post at the Berlin College of Free Arts.